In the first three verses of Amos 5 we see a dire pronouncement of Judgement against the covenant breaking people of Israel. They are told only ten percent of the nation will survive God’s hand. Immediately following this jaw dropping proclamation, Yahweh very lovingly extends His hand of mercy to the nation. “Seek Me and live…”, wait what? Is that all there is to it? Just seek God and live? There must be some penance required? What does God want? How much money will this take? Surely there are some strings attached! Nobody gets off this easily. No way could God be poised to destroy the nation, then in the very next breath whisper, “Seek Me and live”, right? All of the other gods demand sacrifice. Do I have to throw my baby in the fire? What is the cost? Who can pay it? The very notion that simply seeking God to live is so simple, prevents many people in our day and age from coming to faith. God must require something more, a lot more, in exchange for the forgiveness that we do not deserve, right? Hmmm. God has placed no other qualification on the Nation. All they must do is seek Him. The prophet makes clear to the people it is Yahweh they must seek. They are not to seek a place, namely Bethel. They are not to go to Gilgal to seek refuge from the Hand of God. Traveling to Beersheba will not save them. Gilgal will go into captivity, Bethel will “come to nothing”. Don’t trust in the temporal physical world thinking you will escape the wrath of God – you must simply “Seek God” if you want to live. The nation of Israel could have learned from their own family history. Numbers 21:4-9 tells the story of the Bronze Serpent during Israel’s wilderness wanderings. Look at verse 5. What was the nation’s sin? They spoke against Moses and they spoke against God. You two didn’t rescue us from Egypt, you brought us out here to die! As a nation they rejected God’s provision, manna the bread from heaven! But they didn’t just reject God’s provision, they “loathed” or hated it and called it worthless. The text tells us God responds by sending serpents among them. If you were bitten by a snake, you died. The people call out to God, through Moses. 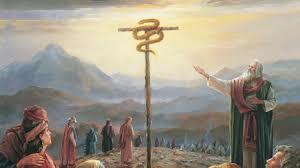 God answers their prayer by commanding Moses to construct a bronze serpent on a pole. The pattern in both Amos and Numbers is the same. God offers provision for life, the people reject God and His provision, God Judges their Sin and offers them restoration. God is still extending a “life offer” not only to the Nation of Israel, but to all of mankind today. Everyone knows John 3:16. I think even many non-believers have heard it so many times they could quote it with some accuracy. But how many of us know the two verses that come before it? Look at what Jesus said in John 3:14-16. Why could Nation Israel “Seek me [Yahweh] and live”, with no other strings attached? Why did the wilderness wanders only have to “Look at the bronze serpent to live”, with no other strings attached? Because God has poured out His wrath on His only begotten Son Jesus, so that all that is required of us is our belief. Jesus’ death on the cross makes it all possible. It really is that simple. Remember, God secured our salvation by paying the highest price possible – it cost Him His Son. Salvation isn’t cheap, but it is free. We have all been bitten by the serpent of sin. Will you “Seek God and live”? Will you look at Jesus on the cross and live? 3 Replies to "Amos - Bread and Serpents"
Thank you Mark. I found this of great use. For some reason we all think there must be something else we have to do. It can’t be that easy. Easy to just say the words but hard when you realize what it really cost. Everything. Brought me to tears knowing that I was really worth it. Thanks for your comment. Salvation truly is the most misunderstood truth in the world. Jesus Christ had to die, be buried, and resurrected because He was/is the only perfect sacrifice. There is no plan B for salvation. We could never earn or payback that kind of price, so God lovingly offers it free to us. We can’t do anything to earn it, we can’t do anything to deserve it, and once we have it we can’t do anything to lose it. What a wonderful God we serve!